1959 produced some notable historical events. Vince Lombardi was named coach of Green the Green Bay Packers, Fidel Castro took over Cuba, American Airlines flew the 1st transcontinental commercial jet flight and Hawaii became the 50th state. And, Chevrolet introduced their all new, redesigned, longer lower wider Impala. Chevrolet magazine and newspaper advertising promoted the full-size Impala with the 290 HP 4 speed “Fuelie” as a fuel efficient “Sports Car for Five”. Sometime after the 15th of May, 1959 someone walked into a Chevrolet dealership and ordered a Roman Red Impala convertible with a fuel injected 283 Cu In engine and four speed transmission. A full-size impala convertible with what amounted to a Corvette drive train! What could they possibly have been thinking! 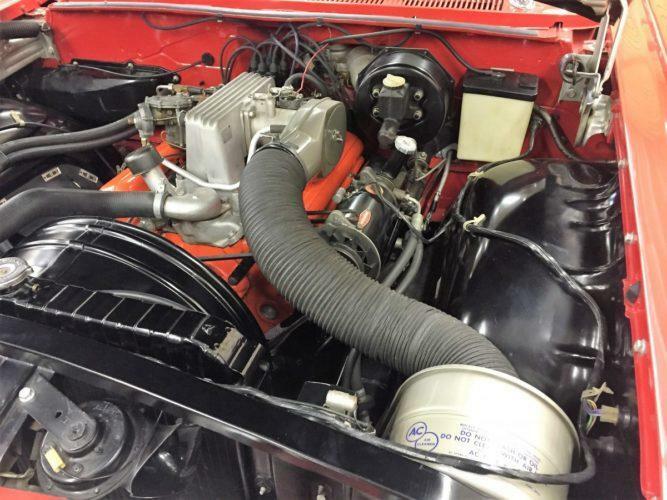 The 290 HP “Rochester Ram-Jet Special” fuel injected 283 Cu In engine with solid lifters, 10.5:1 compression, Duntov cam and 4 on the floor was capable of propelling the Impala to a top speed in excess of 130 mph! A wicked fast car between the lights by day and a luxurious top down boulevard cruiser by night. Multiple sources agree that only *26 full-size 1959 Chevrolets received Fuel-Injected engines. 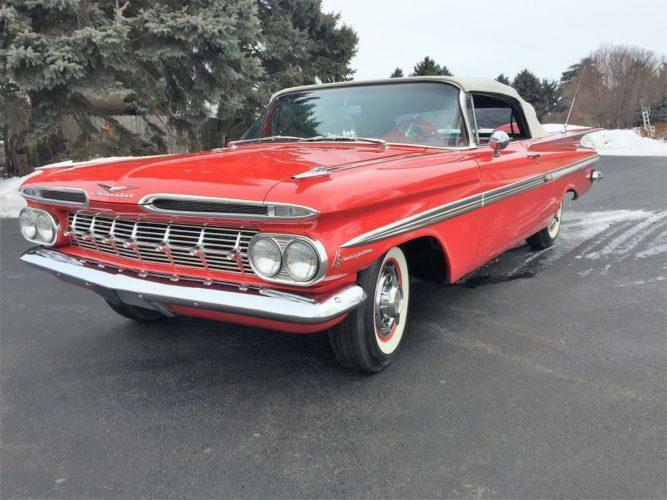 It is conjectured that one or two of the “fuelie” Impalas were convertibles and least one of those was ordered with a 4-speed transmission. Over the years their existence has become legendary and some would say almost mythical. 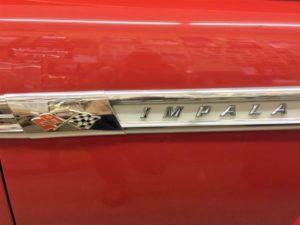 These Impalas are considered the rarest of the rare by collectors of classic full size Chevys. With the bulk of injected 290 HP 283 Cu In engines going into Corvettes the chances of getting one installed in an Impala was slim. Even more remote was the possibility of getting one of the, new for 1959, Borg Warner T-10 Full Synchromesh Close-ratio Floor-mounted 4-Speed transmissions to channel power to the Positraction rear end. A strike at the Borg Warner plant slowed production and all but assured that Corvettes were first in line to receive the new “floor speed” transmission. And so, it was, a convertible body built at the Fisher Body plant in Lansing, MI met up with an engine built in Flint, MI for final assembly the GM Flint, MI assembly plant. 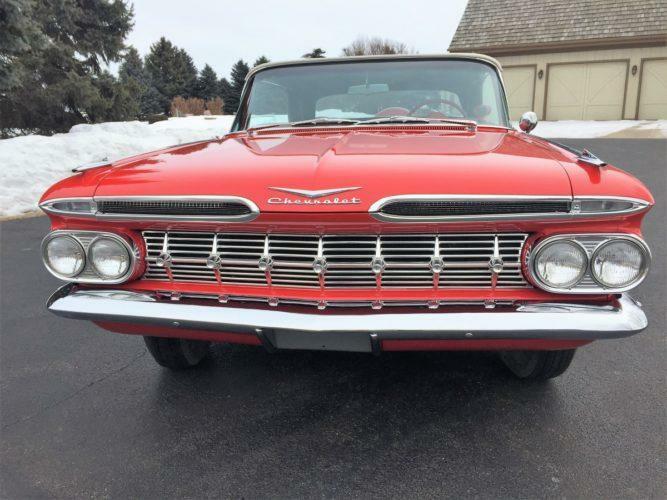 So how did this extremely rare example, considered to be the “Holy Grail” of full size Chevrolets, come to be a part of the Ken Nagel Collection? Our story begins in the early 1980’s. 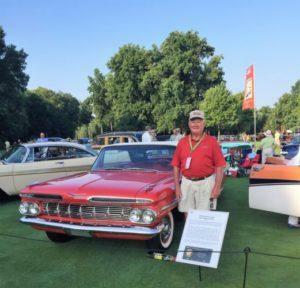 Ed Pogue was in Tulsa, OK for a car show and swap meet. 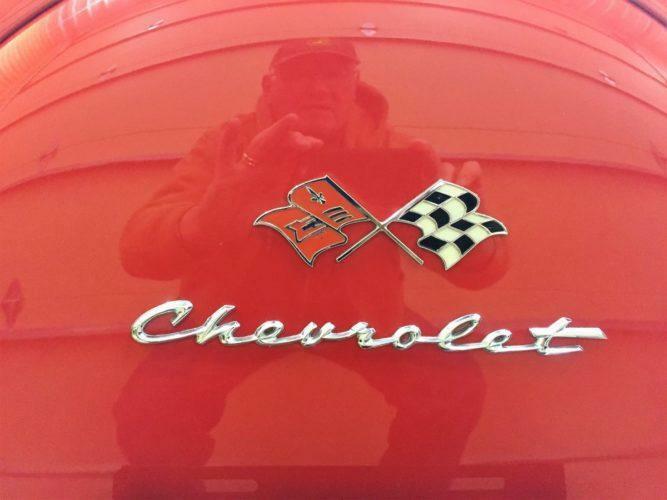 For those of you who may not know, Ed was and still is a renowned restorer of 1958-1965 Chevrolets, as well as a noted drag racer with many 1962 409 trophies on his shelf. His ’62 409 Chevrolet convertible was featured as the centerfold in the April, 1989 issue of Super Chevy Magazine and his spectacular ’40 Ford pickup powered by a 401 “nailhead” Buick, solid lifter cam and 4 speed trans was featured as the centerfold in the September 1980 issue of Hot Rod Magazine. At a swap meet Ed met up with a gentleman who had some interesting parts in his warehouse. 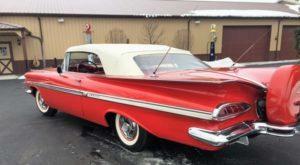 While at the warehouse looking for parts Ed noticed a faded red ’59 Impala convertible that needed restoration. The car was complete and intact but missing the engine and transmission. It was remarkably rust free and had only slight body damage on a rocker panel where it might have scraped a curb. 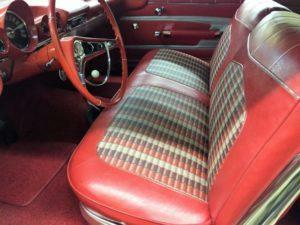 Someone, down through the years had cut a larger hole in the floor to accommodate a different shifter, probably a Hurst. On the front fenders, just below the side spear there were emblem mounting holes. The only full size Chevys that had emblem mounting holes in that location were the “fuelies”. 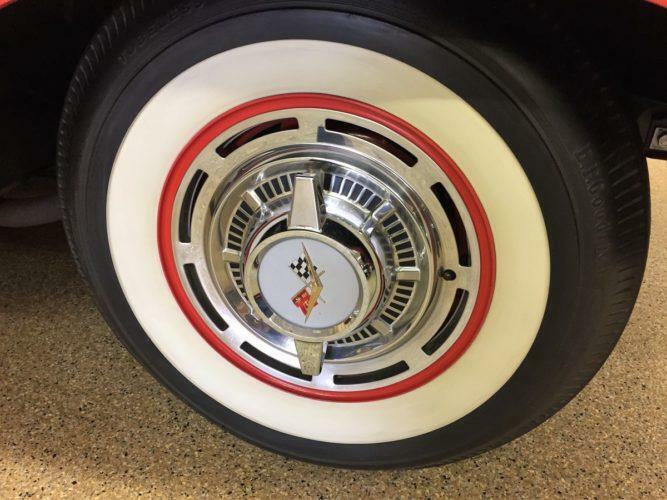 The holes were set to accommodate the “FuelInjected” script and the checkered chevron emblems that were specially made to fit the contour of the fender of the full-size Chevys. 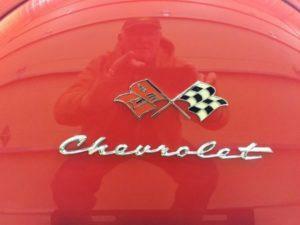 No other Chevy carried these emblems making them almost impossible to replace. The license plate frame on the car was from a dealership in Yakima, WA. If the car spent a great portion of its life in the semi-arid Yakima valley that could account for the rust free body? The clues were starting to add up. Ed found out that the owner of the Impala had an interest in Nova’s. Ed happened to have one and he swapped it for the Impala, straight up. He hauled the Nova to Tulsa and loaded up the Impala for the trip back to Enid, OK.
Back in Enid, Ed had acquired many NOS replacement parts for the convertible he knew he would own someday. The rust-free body with the original floor pans came off the frame and was put on a rotisserie. Ed even block sanded the original floor pans! 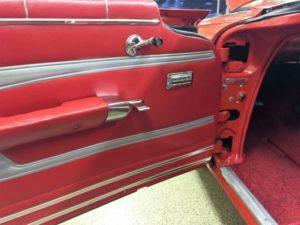 Every nut, bolt, body panel and chassis member was brought back to factory specifications or replaced with NOS pieces. Properly prepped, the body received red oxide primer and 16 coats of factory correct Roman Red Acrylic Lacquer paint. 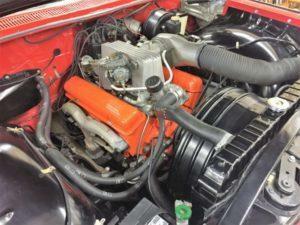 Ed located a matching numbers engine block, heads, manifolds, transmission and drive train components along with a 7014900R “Rochester Ram-Jet Special” Fuel Injection unit. Engine rebuild included replacing the pistons with a NOS set and a Zora Arkus-Duntov designed cam. The “Duntov” cam installed in the fuelie is a NOS part right out of the factory tube it was packaged in. It is the correct “097” (“part number” 3736097) cam with .012 intake and .018 exhaust grind. All stamping, codes and castings were documented and authenticated throughout the process. The result was stunning. Ed went on to show the car around the country earning multiple awards including the Super Chevy Top Ten recognition at the 1988 Super Chevy event in Indianapolis. Shown at Thunder Valley dragstrip in Noble, Oklahoma in the summer of 1994, it was subsequently featured in the January, 1995 issue of Super Chevy magazine. Most recently it was invited to be displayed at the Concours d’Elegance of America At The Inn At St. Johns in Plymouth, MI. 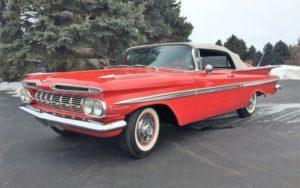 Each taken on their own merits; the “Corvette” power train was exceptional and the all new for ’59 Impala body was stunning, especially in convertible form. Put the two together and the combination became legendary. 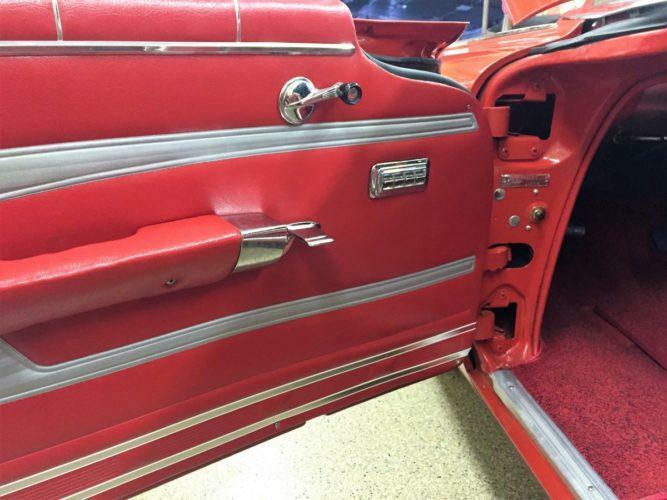 With one small exception, there was no outward hint of what was tucked beneath the surface of the shimmering Roman Red convertible. Unseen deep inside is a wolf masquerading as Little Red Riding Hood. The discreet badging placed on the front fenders just below the side spear and slightly behind the headlight is the only clue to what lurks within. 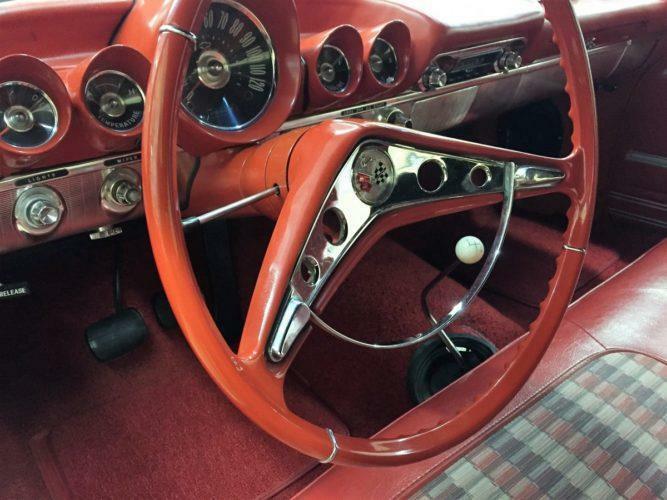 The extraordinary work that went into such minute detail is a hint as to the true nature of the Harley Earl styling exercise that transformed into the ’59 Impala. While the wide expanses of the hood and trunk lid create an optical illusion of almost aircraft carrier flatness there are actually more curves, both subtle and startling, than there are straight lines in the stylish body. Everywhere there are curves. The lop-eared twelve-inch scalloped fins that drape over the iconic cats eye taillights were the deepest compound curve ever pressed into Detroit sheet metal. Even the one piece “straight” California front bumper has a slight curve. Dramatic as it was, the first year for the Impala as a stand-alone model was the last for the “Corvette engine option” and the gull winged styling exercise that dominated its competition. 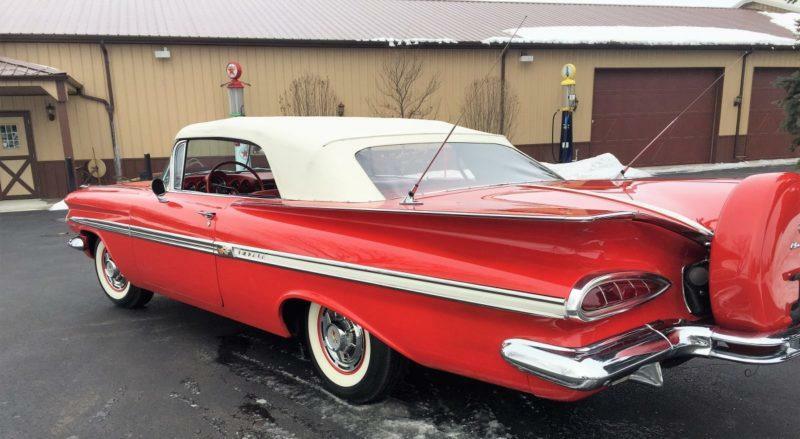 To emphasize “longer lower wider” themed styling, dealerships gave away a 54” “yard stick” that represented the total height of the “all new” 1959 Chevrolet. 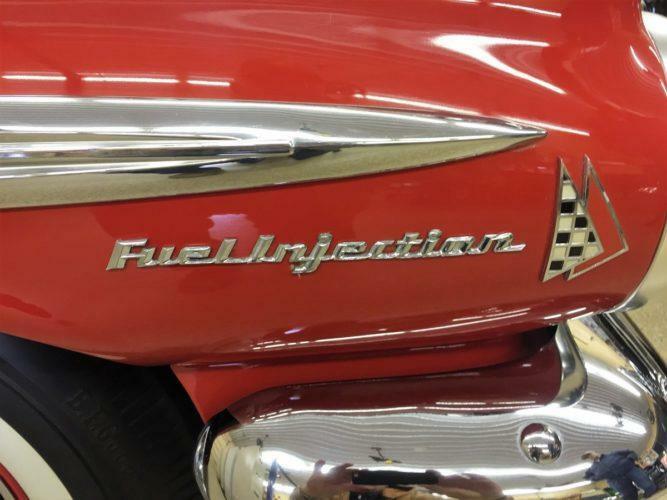 Unfortunately, Chevrolets attempt to gain immense horsepower and fuel efficiency from a high compression fuel injected engine was well ahead of its time. The tell-tale tick of the solid lifters working against the high lift cam in the 283 “fuelie” along with the 4 speed were history. Although the Rochester unit was reliable when set up correctly, it did have its share of issues. It took special expertise to tune the system and few knew how to work on it. Even when the unit was running its best, every now and then there were drivability issues in hot weather. On a full size car, the exotic feature was too advanced and at $484.20, too expensive compared to just $150.65 for the 280 HP 348 Cu In Super Turbo-Thrust V8. The ’59s would be the last models styled under the direction of legendary Design Chief, Harley Earl. In a fitting tribute to his genius, Junior Johnson won the 1960 Daytona 500 with a ’59 Chevy at an average speed of just under 125 mph, proving that the slick powerful cars had what it took on the track too. 1988 – Super Chevy Top Ten Super Chevy, Indianapolis. 1995 – Featured in the January issue of Super Chevy magazine. 2015 – On display at the Concours d’Elegance of America At The Inn At St. Johns in Plymouth, MI. 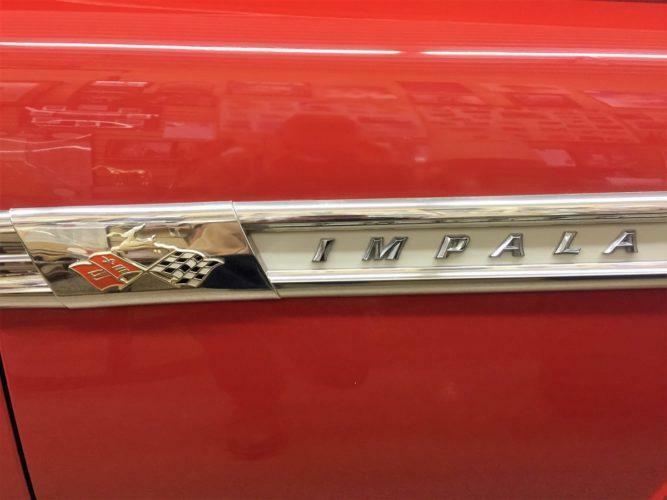 · 26 – Fuel-Injected 1959 Impalas. 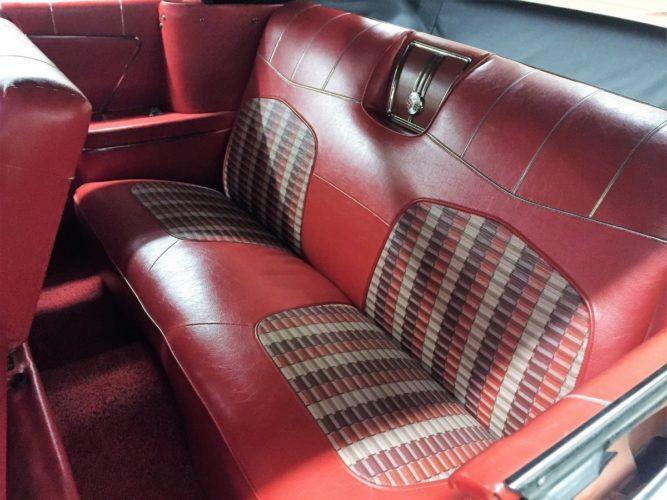 · At least one four-speed “Fuelie” convertible was built. * David W. Temple http://carsofgm.blogspot.com/2011/09/fuel-injected-1959-chevrolet-impala.html One source indicates 26 full-size 1959 Chevy’s received a fuel-injected engine while Rochester’s records indicate 37 units were built for full-size Chevrolet. 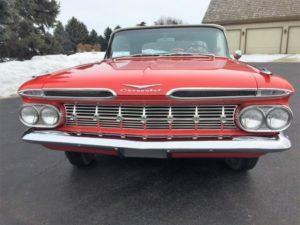 Chevrolet left no records regarding the exact number of convertible “fuelies” built with 4 speed transmissions. At least three FI cars – two convertibles and a two-door sedan – still exist. No breakdown by model and body style is currently available. At least one four-speed FI convertible was built, but its disposition is currently unknown.